Twenty-seven years later, enter Reardon’s robotic player guitar, a pretty awesome little musical bot if I’ve ever seen one. 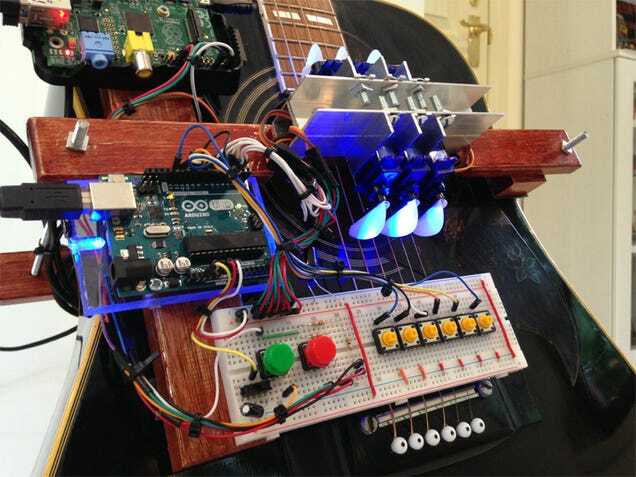 It features both an Arduino and a Raspberry Pi, along with an RC servo for each string. Add 460-odd lines of code (Python, a bit of Bash, and processing sketches for the Arduino), and you have what Reardon describes as the world’s first “Network Time Protocol accurate, Internet of Things connected, Big Ben chiming grandfather clock, firewall log playing, door chiming, guitar playing robot.” Uh, let’s just stick with player guitar.